As season’s change, you have to adjust not only your wardrobe, but your diet as well. For those who are health conscious, having an idea of what types of meals you will be eating in the coming months is a wise move. Since breakfast is the most important meal of the day, it’s good to have an idea of healthy foods to eat for breakfast (http://www.bariatricdirect.com/Oatmeals-with-Apples-Cinnamon-p/oatmealappcinn.htm) on a cold winter morning when you don’t have too much time to prepare but still want something healthy. 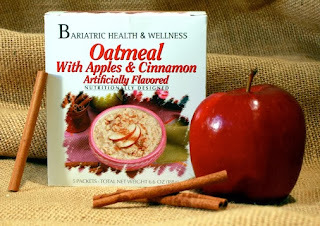 Apple cinnamon oatmeal from Bariatric Health and Wellness is the perfect meal for times like these. Its warmth will fill your home with those cozy scents, reminding you of fall. But, unlike most of the foods that we are used to eating around this time, our apple cinnamon oatmeal is a great snack for the health conscious eater. Just like trees shed their autumnal leaves you will be inspired to shed those unnecessary calories. At only 130 calories, along with 12 grams of protein per serving, this dish is a light and potent way to start your day. With no trans fats or saturated fats, this tasty low carb oatmeal is the perfect way to treat yourself during breakfast time while staying faithful to your commitment to a healthy lifestyle. Oatmeal has always been a popular cold weather dish. At Bariatric Direct, we don’t feel that you should have to miss out on it in order to lose weight, or keep it off. Try our apple cinnamon oatmeal, it will bring the joy of autumn to your home as well as vitality and nutrition to your body during those chilly mornings! Click here for more nutritional information about our apple cinnamon oatmeal. What are your favorite healthy fall breakfast ideas?